la Crème de la Crème! Not all creams are made equal, and not all creams can deliver the desired balance and the desired outcome. That is why we were at The European Cream Workshop at KDU University College School of Hospitality to find out myself the possibilities of Cream of Europe an infinite source of inspiration and delight. Well I am sure some of you have tried these creams for your cooking, baking or beverages. I think the most common among us are the whipped creams. During the workshop Chef Frederic Oger of Pastry Institute of St Honore, KL and Chef David Lee of The Cooking House, KL took us through about how cream is made, what goes into making superior quality cream and we also learnt about the many facades of cream as the Chefs unveiled the 4 unique Malaysian inspired recipes using cream. The workshop started with a welcome speech by Mr Richard Kryskowiak, Sopexa South East Asia Programme Manager. Then follow by Chef Frederic Oger introduction about European Cream. Basically cream is a concentration of fat globules in whole milk. It is obtained by skimming the milk, followed by a homogenization stage to stabilize the skimmed milk fat. Another thing is whether light (12-30% fat) or not (at least 30% fat), creams are also distinguished by the type of heat treatment applied, their viscosity, their structure and their method of packaging. Chef Frederic Oger also demonstrated Malaysian inspired 2 recipes such as Opal Passion Cake and Lady Grey Magnum using European Creams. Different grades of cream are distinguished by their fat content, whether they have been heat-treated, whipped, and so on. There are 8 types of cream such as heavy cream (30 – 36% fat), double crea (43 – 48% fat), clotted cream (similar to double cream but with a higher fat content), sour cream (10 – 19% fat & lacto bacilius culture is added to give the tangy taste), crème fraiche (38 – 48% lacto bacilius also added to crème fraiche), mascarpone (70% fat), butter (cream churned until It separates and become butter & buttermilk), and buttermilk (the liquid which remains when cream is churned to form butter). In the nutshell, dairy cream is higher butterfat layer skimmed from the top of the milk before homogenization. The advantages of dairy cream are its texture and taste is light verses the disadvantages that it demands understanding and training. The non-dairy cream ingredients are hydrogenated vegetable fat base, whiteners, sweeteners, flavouring, sodium caseinate, milk protein from derivative. The advantage of it is that it got high gain of volume and the disadvantages are heavy texture, fatty note and flavouring. Cream is used as an ingredient in many food, including ice cream, soups, sauces, stews, puddings, and some custard base and is also use for cakes. 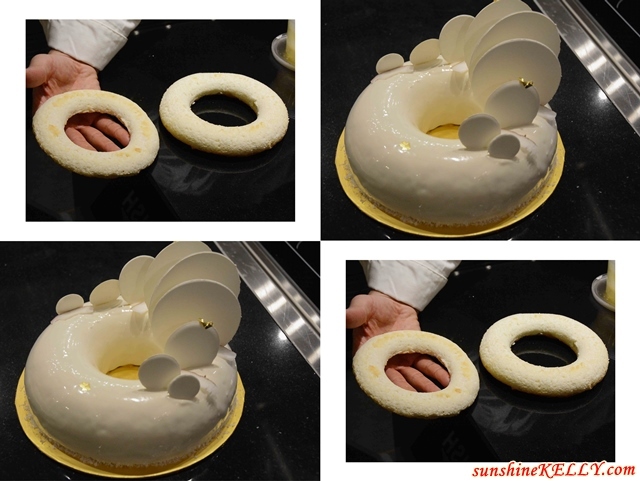 In pastry making, cream is like the master of the palace. It is a signature that delivers well-rounded and full-bodied sensations. Then Chef David Lee demonstrated the art of making Banoffee Tart with Crème Chantilly and Coconut Pavlova, Ginger Cream, Passion Fruit and Mango. Overall I was a fun learning workshop and cooking demonstration by the Chefs. I learnt quite a lot about European Cream, different types of cream and its fat percentage. The more I know, the more I appreciate every bite of my food. Oh my! That Banoffee Tart with Crème Chantilly is da' bomb! Salivating over it now! The coconut pavlova look so cute and yummy!